Phalaena alchimiella Scopoli, 1763. Ent. Carn. : no. 661. Leaf-miner: The larva at first mines the leaves in a gallery leading to a blotch. Subsequently the larva forms a succession of cones (usually three) by folding the tips of the leaves, and feeding withinthem (UKMoths). At first a narrow lower-surface epidermal gallery, regularly intersecting itself. In the next stage the mine becomes full depth. It remains a small mine, either rectangular, or, more frequently, a triangle in a vein axil, with frass along the sides. After a while the mine is vacated and the larva continues in a leaf roll. Pupation in a white cocoon. 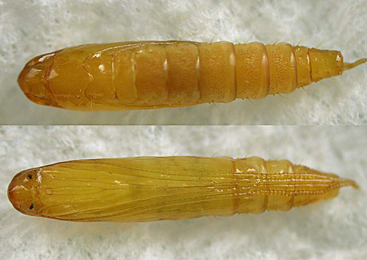 Neither in the mine nor in the larva a difference is known with C. robustella. Moreover a temporal overlap exists between the single larval generation of C. alchmiella, and the second larval generation of robustella. Only the pupae and adults enable a reliable identification (Bladmineerders van Europa). The leaf-mine is illustrated in British leafminers. See Patocka and Turcáni (2005a), Patocka and Zach (1995a) for differences from robustella in the pupa (Bladmineerders van Europa). Time of year - larvae: July -August (Bladmineerders van Europa). Time of year - adults: May to July (UKMoths). Distribution in Great Britain and Ireland: Britain including Chester (Congleton), London (Putney Heath) (UKMoths); Bedfordshire, Buckinghamshire, Caernarvonshire, Cambridgeshire, Cheshire, Denbighshire, Derbyshire, East Cornwall, East Kent, East Norfolk, East Suffolk, Flintshire, Glamorgan, Herefordshire, Hertfordshire, Merionethshire, Middlesex, North Aberdeenshire, North Devon, North Ebudes, North Essex, North Hampshire, North Somerset, North Wiltshire, North-east Yorkshire, Shropshire, South Aberdeenshire, South Devon, South Lancashire, South Wiltshire, South-west Yorkshire, Stafford, Surrey, Warwickshire, West Cornwall, West Gloucestershire, West Kent, West Norfolk, West Suffolk, West Sussex, Westmorland and Worcestershire (NBN Atlas), the Channel Is. (Karsholt and van Nieukerken in Fauna Europaea). Distribution elsewhere: Widespread in continental Europe including Albania, Austria, Belarus, Belgium, Czech Republic, Danish mainland, Estonia, Finland, French mainland, Germany, Greek mainland, Hungary, Italian mainland, Latvia, Lithuania, Luxembourg, Macedonia, Norwegian mainland, Poland, Portuguese mainland, Romania, Russia - Central, Northwest and South, Slovakia, Spanish mainland, Sweden, Switzerland, Ukraine and Yugoslavia (Karsholt and van Nieukerken in Fauna Europaea).